RBTH presents a selection of views from leading Russian media, featuring analysis of the agreement reached in Berlin between EU ministers and Russia and Ukraine, more civilian loss of life from air strikes in eastern Ukraine, and Petro Poroshenko’s proposal to grant himself wider presidential powers as part of amendments to the Ukrainian Constitution. Novaya Gazeta writes that the agreement reached in Berlin by the foreign ministers of Russia, Germany, France and Ukraine does not guarantee "an immediate and reliable ceasefire in eastern Ukraine," as the meeting's participants themselves have admitted. However, the fact that the foreign ministers have met, according to the newspaper, can be understood as a breakthrough. "The desire and need to speak, and not just to blame, is always the first step towards peace. The abatement of hateful language and endless propagandistic labeling seems to be a turn towards peace," states Novaya Gazeta. Before the Berlin meeting, events were heading in a "contrary direction, assuming a dangerous character." The newspaper tells its readers that it was Germany's Foreign Minister Frank-Walter Steinmeier who established the tone of the meeting. He warned his colleagues against "flashes of violence," which "soon may no longer be restrained neither by military nor political means." According to him, the countries must do everything possible in order to use this last opportunity to reach a ceasefire agreement. The Moskovsky Komsomolets newspaper writes that the fierce battles in eastern Ukraine between Ukrainian forces and the pro-autonomy militias of the so-called Donetsk and Lugansk people’s republics continue unabated. 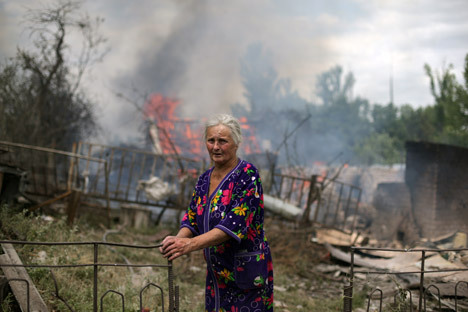 On Wednesday, residential buildings in a village near Lugansk were severely damaged by a massive air strike. At least nine people died, including a five-year-old boy, while five people were heavily wounded. In Kiev on Thursday, meanwhile, fighters from the "Donbass" battalion again picketed the Verkhovna Rada, demanding the implementation of martial law - that is, exacerbating the situation even more. Rossiyskaya Gazeta has published a report from the Lugansk village that the Ukrainian armed forces bombed the day before: "Life finished here exactly at 11:30. The Ukrainian shells exploded. The entire street was wiped from the face of the Lugansk earth. The fire will surely be extinguished. But hatred and incomprehension - what for? - will never be extinguished." Nezavisimaya Gazeta observes how deputies from the Verkhovnaya Rada are discussing the forthcoming amendments to the Ukrainian constitution. The newspaper says that Petro Poroshenko's proposal to broaden presidential authority has not found any support. The newspaper quotes ex-Defense Minister Anatoly Gritsenko, who remarked that Poroshenko has engendered a new trend in personnel politics: "The main banker, diplomat and army chief, the main everything, can only be Petro Poroshenko himself." Nezavisimaya Gazeta writes that Rada deputies have unofficially consented to "the head of state appointing mediocrities to key posts and personally assuming responsibility for the situation." Expert magazine has published an article on the same subject, stating that Petro Poroshenko accords great value to his constitutional initiative, believing "that not only will it augment the efficiency of the Ukrainian government, but also the possibility of reconciliation with the southeast." However, Ukrainian deputies were not particularly inspired by Poroshenko's constitutional amendment package because it "neither provided for a real decentralization of the country, which would satisfy the southeast, nor for the concrete weakening of presidential power."